The pills are described as “badly made”. Read the history below for more information about why this might be. It is also possible that they are well made but have been exposed to moisture, which causes them to be crumble. Although this batch is known to be dangerous, it does not mean that batches which do not look like this will be less dangerous. 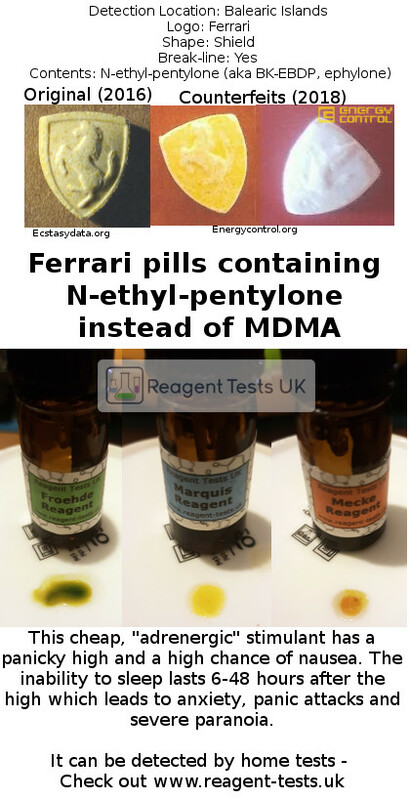 You can determine if a pill contains a different drug instead of MDMA using Reagent Tests. It takes about 2 minutes and does not need special equipment. Each of the kits can be used for up to 40 tests. Alpha-PVP is a long-lasting cathinone. 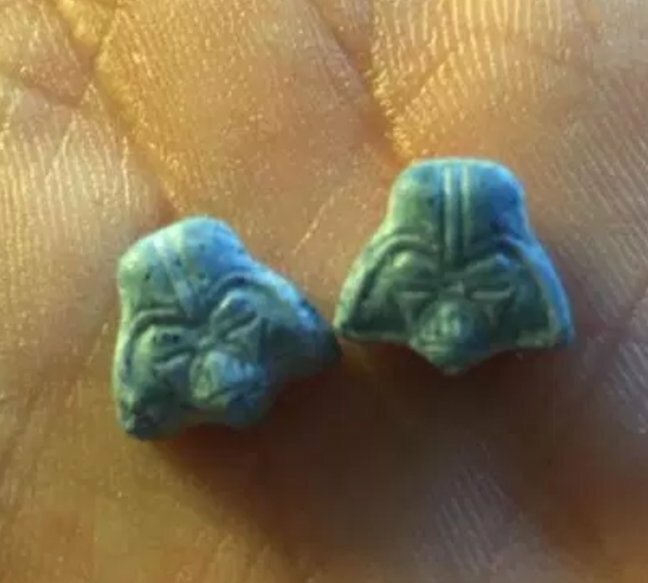 It initially has pleasurable effects which lead people to think it is MDMA but these wear off quickly, causing people to take more. As more is taken, the anxious side effects build up. Each dose increases the time which a person will be unable to sleep for by about 6 hours. This is a severe problem as dosing through a whole party can prevent sleep for several days. During this time the person will develop symptoms of severe sleep deprivation such as horrible anxiety, paranoia and eventually temporary psychosis. If you are suffering these effects then it is important to get sleep. See a doctor and show them this Reagent Tests UK blog, or this information from The Loop. These pills contain 7-8x the normal dose of alpha-PVP which will massively increase the risks. As a stimulant, doses like this could cause a risk of heart complications as well as the other side effects. Carry on reading the blog post for more information about UPS pills and alpha PVP. UPS ecstasy tablets have been popular for a long time. 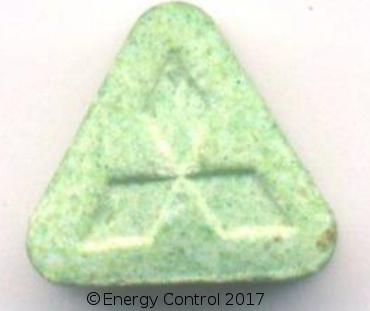 They were among the first very high strength tablets to emerge in the 2010s and quickly obtained a reputation as being well made tablets with a large amount of MDMA in them. 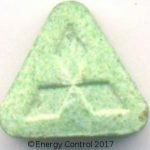 MDMA is the active ingredient that is supposed to be in all ecstasy tablets and people who use ecstasy pills will be seeking out those which contain only MDMA. The market for MDMA tablets is, of course, completely unregulated and uncontrolled and there is nothing to stop sellers from being dishonest. Counterfeit tablets quickly begin to appear after a tablet gains a good reputation as less scrupulous manufacturers try to use the popularity to sell their own pills which might be weaker, may contain no MDMA or may even contain a completely different and potentially much more dangerous drug. Compounding this issue is the ease with which pressing equipment for pills can be obtained. 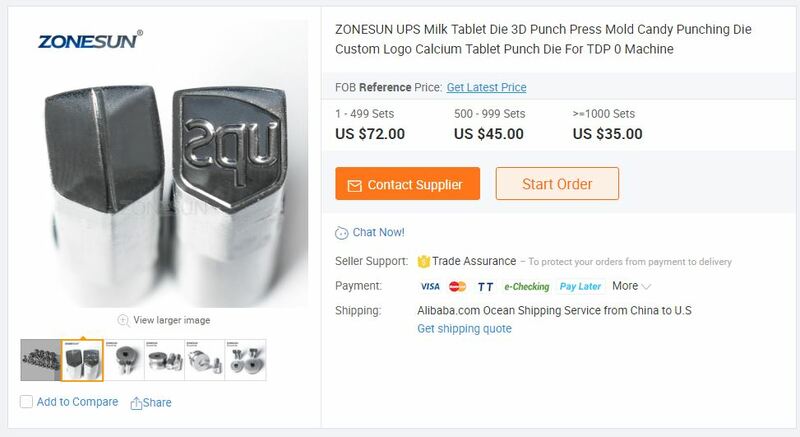 Ten minutes searching online easily reveals sellers of “tablet dies”, the moulds use to press tablet material into a tablet, for around £50. 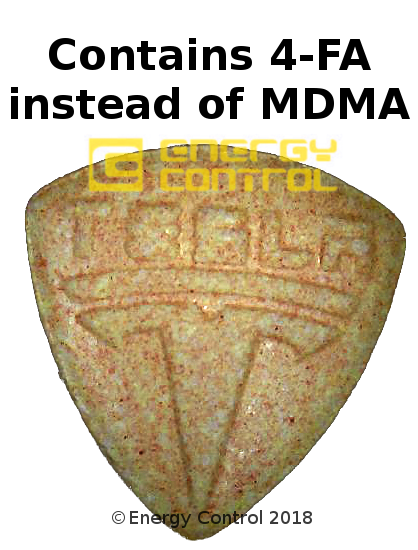 So it doesn’t take much time or money for a pill to be cloned, and once it’s cloned the colour, shape and logo of an ecstasy tablet from someone else’s pill report tell us nothing about what’s in it. It’s impossible to tell from visual appearance if the pill is from a different batch, maybe even from a different manufacturer. UPS pills are no different. The first test result on Ecstasydata.org is from May 2015. Within 8 months there is a clone which contains a mixture of drugs including caffeine and methamphetamine (“crystal meth”). Fast forward to 2019 and the original batch of UPS pills are long gone. Even half sensible manufacturers will not make UPS pills because they know that the reputation has been ruined by pill reports of bad UPS pills. The only manufacturers remaining are the most amateur available, looking to make some quick cash as easily as possible. In the third week of January 2019 three teenage boys were taken to hospital in Manchester, UK with severe symptoms, one of which was put into an induced coma due to the risk. They had all taken “UPS” ecstasy tablets, thinking that they would contain MDMA. After police were able to submit the tablets for testing, they turned out to contain a completely different drug called “alpha-PVP”. The lab was not able to determine the exact amount in the tablets but it is thought to be 7-8x a typical dose, which is a huge amount. Even drinking 7-8 cups of coffee in one go would cause problems, especially for a teenager. Alpha PVP is a stimulant from the cathinone family. While this family includes mephedrone, it is a very distant relative of mephedrone itself and has much higher risks attached. Alpha-PVP has been called “flakka” and “gravel” by media in the US but there is no evidence to suggest that people using the drug call it this. Stimulants activate the body’s reward system to create a sense of wellbeing and make people talkative, and alter how the body manages alertness and rest, causing people to feel energetic and prevent sleep. They also significantly increase blood pressure, heart rate and cause sweating. In high doses, side effects become much more pronounced and the body finds it harder to excrete the drug out through its normal mechanisms. This is especially true with cathinones like alpha-PVP. Although the pleasurable effects last for about 2 hours, the drug lingers in fatty tissue for much longer. The more doses that are taken, the longer that the drug has a chance to build up and therefore the longer it is released back into the blood for, after people want the effects to stop. People are tricked by the initial pleasurable effects of alpha-PVP into thinking they have just got “weak MDMA”. Not wanting the party to stop (and unknowingly compelled by the action of the drug on their reward system) they take some more. This cycle continues until the party is over, by which time the drug has been building up in the body for hours. This becomes a huge problem as the drug prevents sleep, a vital recovery process for the body. Even without drugs, sleep deprivation can cause severe paranoia and temporary psychosis, but with a stimulant drug on board this happens MUCH faster. Coupled with the horrible comedown that cathinones cause, this can lead to intensely distressing and even very dangerous behaviour. N-ethyl-pentylone (aka BK-EBDP or Ephylone) has caused problems before where it has been sold as MDMA due to the identical visual appearance but this year has seen an increase in the number of cases detected and more alerts have been issued. The Loop has now detected two batches of pills in the UK containing these closely related drugs, as well as a number of different batches of crystals. The mis-selling of pentylone and its analogues is particularly insidious because the effects are initially quite similar to MDMA itself, but the empathogenic effects are not so pronounced and the euphoria fades more quickly. This leads people to redose, but redosing seems to disproportionately extend the time to clear the body and this makes sleep very difficult or impossible for up to 72 hours without further medication. This stimulated sleep deprivation is horrible at best, and multiple cases of temporary psychosis have been recorded. If you think that you have taken MDMA then The Loop has written a guide on what to do which you can see here. 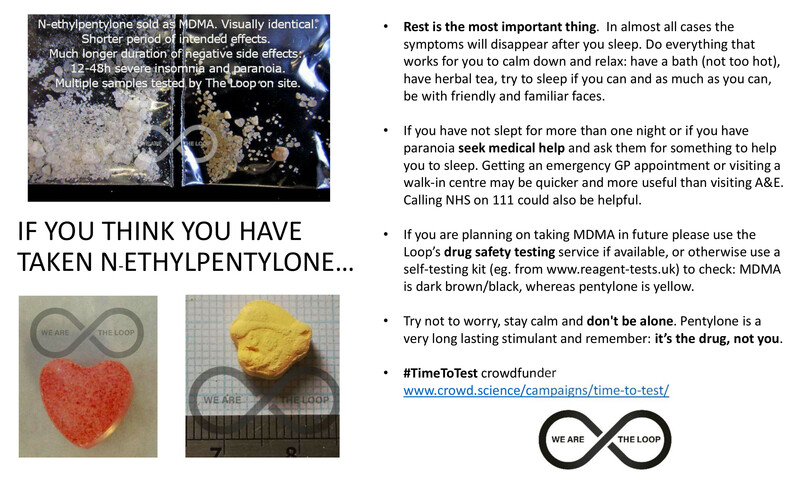 This very useful information tells you what to do if you can’t sleep after taking MDMA. What’s the best kit to test drugs at home? MDMA, Ketamine, Cocaine and LSD are all easy. Taking drugs is risky business – doctors have to spend so long in training because humans are complex and their reactions with drugs aren’t always easily predicted. Fortunately for doctors, prescription drugs are tightly regulated and in developed countries counterfeits are extremely rare – when you get 10 mg Ritalin tablets prescribed, you can be sure that each tablet will contain exactly 10.0 mg of Ritalin, and you’ll be able to get great advice from your doctor about the most effective way to take them. Unfortunately the recreational market has no regulation whatsoever – the government leaves quality control in the hands of criminal organisations, and they’ll sell whatever makes the most money for them. Unfortunately this often means that drugs are impure and in some cases they can be something else altogether, without a trace of the advertised ingredient inside. Without the ability to rely on Trading Standards to fix this, we have to take matters into our own hands. But without the multi-million labs used by government organisations, how are we supposed to do any real testing? It’s true that testing at home isn’t as good as testing in a lab, but if we can identify when a sample has been mis-sold, then we have the chance to avoid the problems associated with not knowing what we’re taking and remove a lot of the potential for harm. And luckily for us, while detailed chemical analysis can be challenging, simply telling whether a white powder contains Molecule A or Molecule B can actually be very easy. 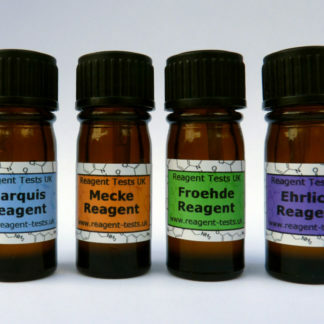 Reagent tests work by changing colour roughly based on the “functional groups” or types of atom in a molecule. If Molecule A has an oxygen double bonded to a carbon and molecule B does not, then it will give a different colour. Bingo. We usually use three different “reagents” because some molecules have similar groups inside them, and each reagent is sensitive to different groups. A reaction chart showing expected colours for different drugs. The best part is that we don’t even need to know which bonds or groups a molecule has because we can just compare the colours we get to what we should expect for the compound we want. So at the end, we compare our three colours to a “reaction chart”, and if any of the colours don’t match then we know that we don’t have the molecule we expected. Step 1 – Determine which drug you think you have. 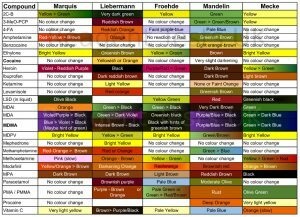 If you don’t know what compound you’re expecting, you won’t know which colour change to expect. Because different reagents work best with different drugs, it helps (but it is not essential) to match up the best reagent. 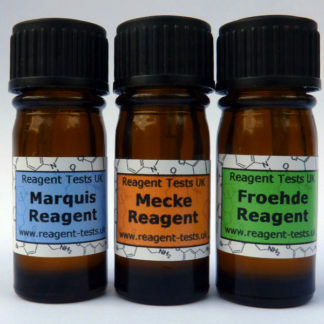 At Reagent Tests UK we’ve named our multipacks according to which drug they are most suitable for, so this bit is done for you, but we’ll go into the science, in case you’re interested. 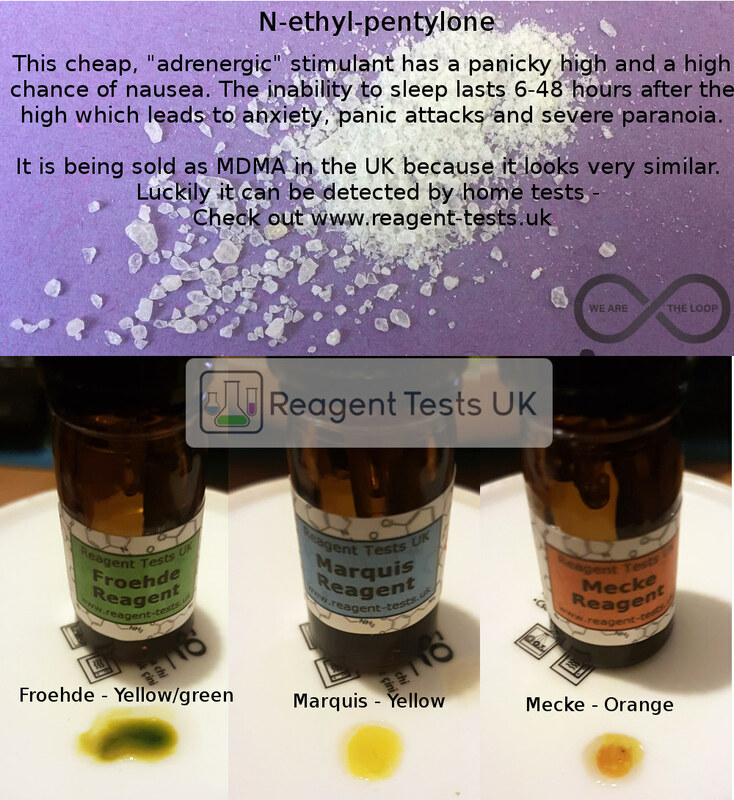 The MDMA testing multipack is a kit of three reagents selected for testing suspected MDMA. 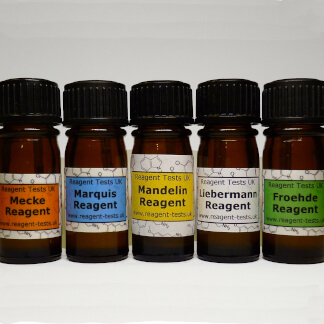 The marquis reagent is very popular and has a wide range of known reactions, even for uncommon adulterants. The froehde reagent has a great shelf life and picks up PMA being sold instead of MDMA, as well as helping to identify 2C-B in pills. Finally, the mecke reagent allows us to identify DXM, which has a similar reaction to MDMA with the marquis reagent but very different effects (black vs dark grey for marquis but black vs yellow for mecke). Ketamine is a tricky one because it doesn’t react strongly with anything but we can use reagents to see if it’s been cut. The liebermann reagent goes light yellow with ketamine, but for methoxetamine (MXE) it goes orange-brown and for 3‑MeO‑PCP it goes a dark reddish brown. 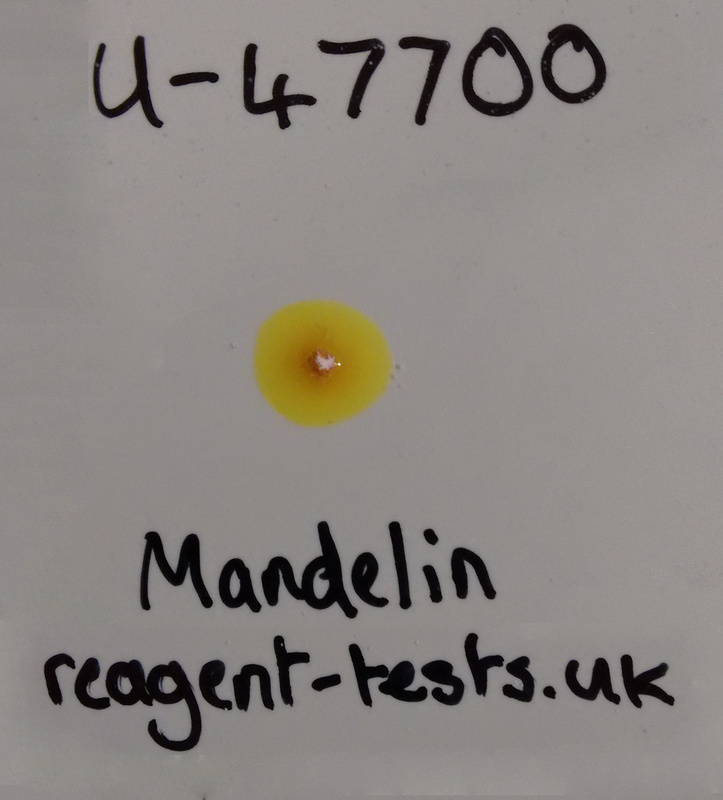 We can use the mandelin reagent to narrow things down as it goes green for 3‑MeO‑PCP and doesn’t change colour for methoxetamine. This can be very useful because most people don’t want their ketamine trip to last 6-8 hours from a tiny bump! That means we can use the Cocaine testing kit as a perfect way to check ketamine for dodgy goings-on. 2C‑B is a psychedelic drug which is sometimes sold as pills or powder and has a very strong effect from a tiny amount. Lots of people enjoy this but you wouldn’t want to take an MDMA sized dose expecting the effects of MDMA and end up in a strong trip! 2C‑B turns green with the marquis reagent and yellow with the froehde reagent. 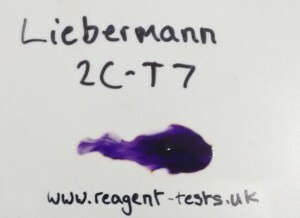 If you’re considering blotter paper as the dosage form then the ehrlich reagent allows you to see if LSD might be present, as it goes purple for LSD but provides no colour change when testing 25I‑NBOMe, 2C‑B, DOB and the others in these series. We have our MDMA & psychedelics testing kit with the right reagents for these compounds. The great thing about reagents is that they change colour with almost every drug, and we include a reaction colour chart and instructions with every order. So no matter what you were expecting, you can see if you’ve been sold something else instead. Don’t forget that even if your compound is what you expected you should still be careful, and very pure drugs can be a big risk if you start with a big dose expecting something less pure. So ideally weigh how much you’re taking, and if you’re not weighing something like MDMA then always #CrushDabWait. If you’re using more than one of these on the list then don’t forget we also offer a combination kit to test drugs which contains our five most popular reagents. Four people were hospitalised around Manchester on Saturday and a further four were hospitalised on Sunday, but a simple home reagent test could have prevented this for all of them. A batch of something they had bought as MDMA turned out to be purified crystals of synthetic cannabinoids (ADM-FUBICA), more commonly known as “spice” which comes heavily diluted onto plant leaves and is smoked. In this diluted form the effects are slightly like cannabis but with much higher risks. In their crystalline form, an amount the size of a match head can cause serious harm, as has been seen here. The crystals had the same appearance as MDMA, but those who know their chemistry will be all too aware that many chemicals look incredibly similar and just a small impurity can change the appearance as much as switching two completely different compounds. 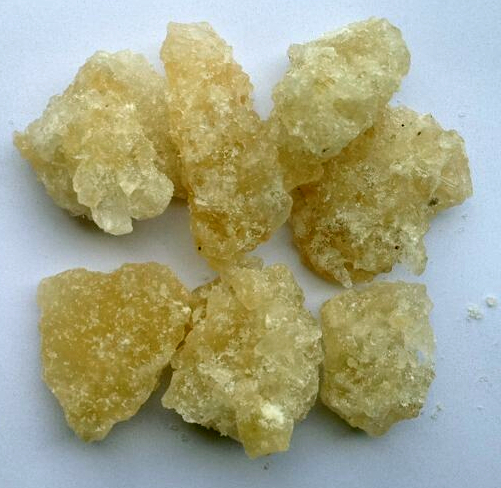 Appearance is not enough to identify MDMA crystals – you must test for substitutes if you want to be safe. Because of the very high potency and risk of cannabinoids, taking a test dose alone is not enough to prevent harm – the amount that is a “test dose” for MDMA is an overdose amount for a cannabinoid. Therefore the only reliable way to distinguish compounds when a mix-up like this occurs is to test, either using a lab test or a home test such as the MDMA reagent test multipack. A home test like this takes about 4 minutes and gives a triple black reaction for MDMA, but a completely different colour reaction for ALL different kinds of cannabinoids and other possible substitutes (accidental or deliberate). This makes testing for “spice” in MDMA incredibly easy, without the need to take a test dose that could be dangerous even if it’s small. Those in the area around Manchester buying “magic” as a drug or “pink champagne” are urged to be especially careful – try to use chemical names instead of slang names if you do decide to use MDMA, as this can increase confusion around what you are buying. In a move which will probably not surprise anyone, the UK government has formally stated that it will make ethylphenidate and its related compounds class B drugs. 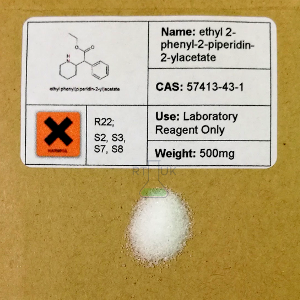 Ethylphenidate gained popularity both as a smart drug used by some students and as a recreational stimulant and is closely related to methylphenidate (ritalin) but has a reduced potency and shorter duration. When ethylphenidate was sold legally it was commonly sold “for research purposes only” to avoid medicines legislation. The ban follows the advice of the Advisory Council on the Misuse of Drugs (ACMD), whose role is to perform detailed research into issues relating to drugs for the UK government so that it can make informed decisions about drug policy. The ACMD has done extensive research on ethylphenidate and its analogues, with multiple comments released about their prevalence and harms and on 10th April 2015 it recommended that ethylphenidate should be subject to a “Temporary Class Drug Order” (TCDO), which criminalises import and sale but not possession. The ACMD struggled to find detailed information about the group of compounds and remarked in June 2016 that the TCDO had been very successful in reducing use and that more time was needed for a good decision. Ethylphenidate is controlled in China, Denmark, Estonia, Germany, Hungary, Italy, Poland, Portugal, Slovenia, Sweden and Turkey. It is also classified under analogue scheduling in the US and Australia. As well as ethylphenidate, a number of less popular analogues were also covered, perhaps the most interesting being 4-fluoromethylphenidate which was reported to be more potent and be much less compulsive. The change in the law will come into force on the 31st May and cover the substances listed below. Class B offences could result in up to 5 years for possession or up to 14 years for supply. Following advice from the Advisory Council on the Misuse of Drugs (ACMD), the Home Office has moved to ban a range of designer sedatives including etizolam, which has gained wide popularity for self-medication of anxiety and the compound U-47700, an opioid which has frightened US media and displayed issues of chemical damage to tissues of very heavy users. You can see our test results for U-47700 here and here. The ACMD’s role is to perform detailed research into issues relating to drugs for the UK government so that it can make informed decisions about drug policy. On 20 December 2016 it published two of its typically detailed overviews, one dedicated to U-47700 and one on the novel benzodiazepines. These detail various aspects of the drugs usage and distribution patterns and the research allow the ACMD to make recommendations on scheduling. Although the novel substance market has been all but wiped out by the Psychoactive Substances Act, (which renders anything “psychoactive” illegal to sell or import) Police Scotland has reported that etizolam is being sold as “valium” by street dealers. Benzodiazepines may be used to self medicate anxiety disorders, or recreationally for relaxation and carry significant risk of addiction and dependence, with withdrawals for heavy users potentially being severe enough to be fatal. Police Scotland also reported that there had been an increase in deaths involving etizolam and an 8x increase in people found driving under the influence of the drug since 2015. The Home Office decided to move directly to full scheduling instead of temporary scheduling as recommended by the ACMD, and on 3rd May 2017, the full legislation was published, to be enforced from 31st May 2017. This means that etizolam is illegal in the UK as a class C drug with up to 2 years for possession, and U-47700 is illegal in the UK as a Class A drug with up to 7 years for possession. 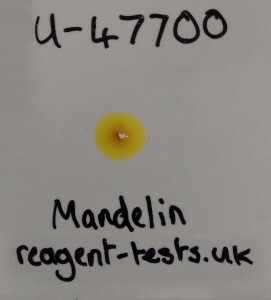 If you do use U-47700 then you can buy tests to help detect mis-selling in our shop. The most suitable setup is the MDMA & Cocaine Testing multipack.